Hello and welcome to the LAST stop on this fun a fabby blog hop. If you've made it this far, then you've been treated to some pretty SWEET creations! I hope you have enjoyed it and that you've found more inspiration than you know what to do with!! I have a couple of cards to share with you today, so I'll get right to them. My first card was made using one of my "old favorites" in the Peachy Keen Stamps line of MANY wonderful Halloween themed images. I made this card using PK-607A Cat in the Jack stamp set. The patterned paper and ribbon is part of the September Peachy Picks Kit. 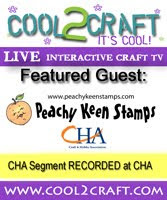 To keep perfectly coordinated card stock, patterned paper, and embellishments coming to your door every month, sign up today for the Peachy Picks Kit! You'll be glad you did!! I stamped this cutie with Memento Tuxedo Black ink and colored with Copic Markers. The sentiment comes from the PK-131 Happy Haunting Ghosts stamp set, and the pearl flourishes can be found at PKS, as well. For my second card, I used one of the new Halloween Holler stamps, illustrated by Steve yarbrough. This one is SY-908 Halloween Holler Mummy Man, and he's just the cutest little mummy EVER!! The tag, card stock, ribbon and patterned paper are again, from the wonderful Peachy Picks Kit. For the sentiment, I pulled out the new Stamp of the Month set, PKSC-09 September 2012 and stamped the flourish and sentiment..
Wishing you a day filled with happy stamping!!! WOW!! What a way to end this awesome hop! I LOVE LOVE LOVE your super adorable cards! Cute PKS and great coloring!!! Your coloring is just Mind Blowing. Love both of your creations. Oh, how fun, Lorie! Your Halloween cards are gorgeous! Wow! These are simply fabulous! I love them both and everything about them! What a fun hop this has been! Thanks for sharing such amazing projects! Mind blowing is right! You just make your images so 3 dimensional! Such an inspiration! Love you! Very nice cards. Thanks for sharing and inspiraring. Lori ~ jaw dropping GORGOEUS cards! I LOVE the pumpkin card and the papers, colors and of course your coloring. The mummy card is so FABULOUS too! You seriously AMAZE me with everything you do ~ always! I would love to sit and watch you color!!! Fun hop!!! Lorie both card are fantastic. I love the colors, what amazing job on them. I need some coloring classes, haha. The first one is may favorite with this cute cat. Thanks for share amazing projects. Awwww, how cute are these. I recently purchased the mummy stamp and I just love him or her :) Thanks for sharing. wow! these are great!!!!! great job! Lorie,can I just say.......FANTASTIC,BEAUTIFUL cards!!! The first one is absolutely GORGEOUS! And the second one is SUPER CUTE!! I love all the beautiful colors on these! I had a blast hopping today. And I have been inspired to try using so many new techniques from this experience today! Love the mummy! too cute! Wow your cards are fabulous! Love your coloring and the addition of the bling is awesome! Great cards and a very fun blog hop. Thanks to all the very creative designers. Lst but not least! I would be so disappointed had I not gone to all the blogs. your cards are elegant with a flare fun! Love this combination ! will have to try you idea! thanks for sharing! Wonderful cards. The mummy guy is so cute but the cat and pumpkin is my favorite. Your coloring is spectacular. Thanks for sharing your work. AND....the saved the best for last! Not that all the other projects weren't fabulous, but your cards are AWESOME! I love your style Lorie! You make cards look like pieces of art, and these two just prove my point! All the pearls and your amazing coloring is so pretty! That kitty in the pumpkin is just adorable and I LOVE your mummy! Thanks for sharing your wonderful cards! Great coloring on both--I like all the pearl swirls on the first. Oh....what fun cards! Love that sweet pumpkin and all that fabulous bling! And, your mummy tag is just too cute, I love the layout! Wonderful Halloween cards! Super cute! Even after Kathy, who had to be a tough act to follow! Yours are awesome also! What a fun hop this has been!Thanks for all the inspiration! Great cards...beautiful and fun!! Thanks for sharing! Super Duper Cute Cards! !Awesome job on the coloring!! Happy Fall to all on this blog hop! These are great cards! Love the mummy! I want to make one! Both of your cards are beyond cute!!!!!!!!! Your cards are great! That pumpkin is so adorable. I love your card with the little pumpkin and kitty! Gorgeous cards!! I am crazy about the coloring and your embellishments!! Your cards came out great Lori, as usual, love the coloring. Very cute images. this is great! Love the papers.. that cat and pumpkin is so cute!! Those pearls are fantastic! The mummy is cute too!! Awesome coloring! oh that mummy makes me giggle! love your creations! wowzzers so pretty !! lovin the pearls !! and the coloring awesome job !!! Wow I love your cards, thanks for all the ideas!!! So cute these cards are! I love how you colored the pumpkin. LOVE the Cards! SOOOO cute!!!! The blog hop was soooo good! So cute! Love the dotted paper and how you used one half of that stamp! Man, I really have to color more! The whole blog hop has been absolutely inspirational! I loved the many ways the design team "did their thing" with PK stamps! Your cards are adorable! Time to go and do some shopping! This has been an amazing hop but then they always are when the Peachy Keen designers (old and new) are on the list! Love your cards and loved everything I saw today!! Love the cards, especially the pumpkin and the cat. Love your cards - they are both great! every time I see your cards I just bow down to the Queen of Copics!!!! Cute, cute cards. I enjoyed hopping. your cards are too cute, but love the kitty and pumpkin! great job on your coloring. These cards are awesome. I enjoy looking at all your projects. FABULOUS coloring Lorie, as always your cards are stunning!!! TFS, have a wonderful day! Love the cards. Loved the hop! I MADE IT!! Wow, this was my first Blog Hop...fun, but it took a while with my old computer! I love your cards. Very visually stimulating. TFS. Lorie this are beautiful Halloween cards!!! love your colouring!!! that mummy took my heart. He is so adaorable. Thanks for sharing. Very cute cards. I'm getting a lot of great ideas. What awesome coloring. I love the cat! You made the last stop on the blog hop just as exciting as the first. The entire design team did a wonderful job. Great work! Terrific cards! I just love the cat and pumpkin with all the bling! I love these cards. You make a great caboose to a wonderful hop! These 2 cards are absolutely adorable. Your cards are wonderful...love the bling! Lorie, my dear friend, I adore your cards. I fall in love with PKS over and over again while hopping. So much inspiration in this hop!! Both cards are so cute withe the peachy faces. These cards are so nice. Love your coloring. Great Halloween cards!! The mummy is really cute & I love love love the cat & pumpkin. Great cards. Amazing coloring. Thanks for sharing. Love both your cards, but especially the cat in jack! These are beautiful Lorie! As always you are an amazing inspiration to all of us and such a wonderful person to lead the team!! Awesome Cards Lorie--love the colors!